Inches away: Rob Hennelly is beaten by one of Galway's penalties in the shootout. Photo: Sportsfile. For the second week in a row Mayo faded out in the second half and were brought to penalties, but this time they were the ones to lose out on spot kicks going down 4-2 to the Tribesmen. Diarmuid O’Connor was the first one up to take a spot kick, but his effort was easily saved by Maghnus Breathnach in the Galway goal, Liam Silke slammed his home with aplomb to edge Galway in front - before Brian Reape brought Mayo back level with their second spot kick. Johnny Heaney made no mistake with Galway’s second and James Kelly slammed home Mayo’s third effort to keep the contest alive. Up next was Barry McHugh whose injury time goal levelled the game up up in normal time - his effort bouncing down off the bar and over the line. Andy Moran who came on as sub at the start of the second half was Mayo’s fourth taker, but his effort was saved by the Galway custodian - leaving Tom Flynn with the chance to seal the win and send Galway into next weekends final against Roscommon and the big midfielder made no mistake. It looked like Mayo were heading for the decider - but after missing three good goal opportunities earlier in the half Galway made no mistake with their fourth three minutes into injury time. The ball was floated in by Michael Daly over the heads of the Mayo defence and Barry McHugh who scored 1-6 over the day made no mistake, slipping the ball low under Rob Hennelly to level it up at 1-9 each at the full time whistle. January football might not be the prettiest - but that didn’t stop a crowd well in excess of 5,000 from making their way to Tuam Stadium for this meeting of the old rivals and Mayo started in fine form going 0-4 to 0-0 up inside the opening 15 minutes - with Conor Diskin who put in an fine showing getting the scoreboard moving six minutes in when he tapped over a mark he won inside the 21 meter line. That was followed by two frees from Jason Doherty and one nice effort from play off the boot of Brian Reape - who showed plenty of endeavour throughout the game. Galway got things moving for them 17 minutes in through a John Daly free after Cillian McDaid was fouled out on the right hand side and ten minutes before the break they cut the gap back to just two through McHugh’s first pointed free of the day. Reape kicked Mayo’s fifth point of the afternoon after making a smart run to create some space close in eight minutes from the short whistle and two minutes later Jason Doherty grabbed Mayo’s goal - waiting as a ball from Michael Plunkett bounced in the penalty area and escaped the clutches of Declan Kyne to give him the space to direct it home from close range. McHugh’s second point was the final score of the half from a close range free to leave Mayo leading 1-5 to 0-3 at the interval. The second half started with Mayo edging in front even more through another Doherty free - but two points on the spin from McHugh kept Galway in touch and just trailing by four points - a gap that existed for most of the second half. Doherty and McHugh traded points before Diskin’s second of the day put Mayo five clear with 19 minutes left. John Daly brought it back to four not long after and Galway were starting to grow in confidence and first Michael Daly saw his effort come back off both posts, then Tom Flynn had an effort saved by Rob Hennelly - which McHugh converted from the resulting 45 to put just three between the teams with 12 minutes to go. Reape looked to have steadied the Mayo ship with a well taken point when Diarmuid O’Connor was fortunate to see his intended hand pass to the Moy Davitts man - miss everyone, so he collected it himself and then found Reape who slotted over Mayo’s ninth and final point of the day. 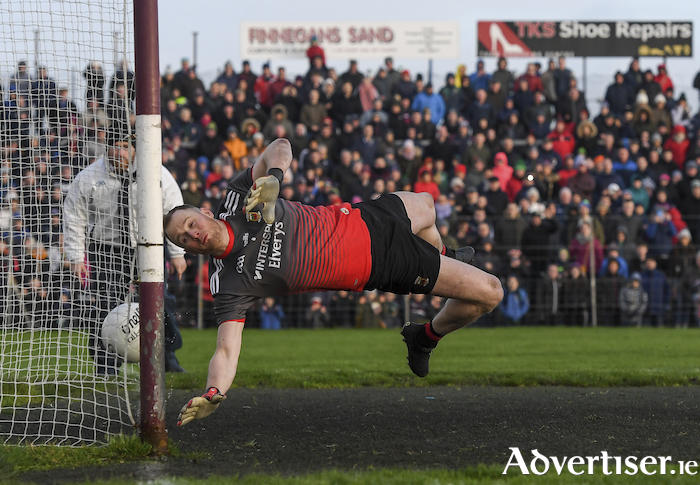 Michael Daly got the point his efforts deserved to cut the gap back to three and then with 27 minutes gone in the second half Eoghan Kerin had another Galway goal chance that was snuffed out by the Mayo rearguard. Galway then contrived to mess up two easy looking chances from frees to close the gap and it looked like Mayo would hold on - but not for the first time in recent years Galway got a late goal that stung Mayo and set up the penalty kick competition.